Asnelles is a village located in Calvados department. At the seaside you can find a beautiful sandy beach safe for children. You can wander in the streets of the old village and take the small footpath that keeps the memory of William the Conqueror. The beach sheltered a part of the Arromanches artificial harbor in 1944. In Asnelles enjoy a seaview holiday rental. This seafront residence provides cottage and apartment accommodation just a few metres from the beach. It is located in Asnelles and provides free Wi-Fi internet access. 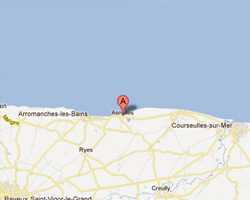 Residence Gold Beach is located 200 metres from the beach in Asnelles-sur-Mer, close to other D-Day Landing Beaches. It offers free Wi-Fi access and fully furnished apartments, some of which overlook the sea. Residence Gold Beach is located 200 metres from the beach in Asnelles-sur-Mer. It offers free Wi-Fi access and fully furnished apartments, some of which overlook the sea. 1 Bedroom(s), 2 double bed(s). short stays possibility. Final cleaning possibility. 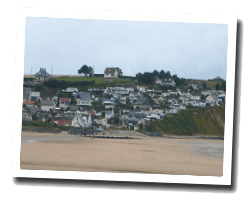 Facing the Arromanches harbor vestiges , The Morvandelle is a holiday home Located on the seafront, with direct access to the promenade and the beach. 2 Bedroom(s), 3 double bed(s).